The Beard Team USA Blog: Look out, Toot! 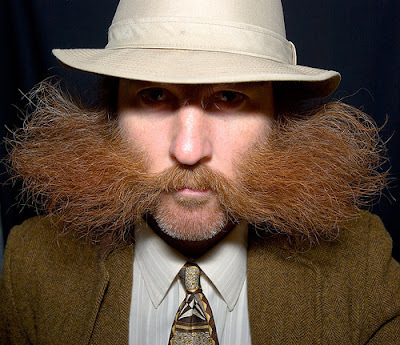 On the eve of the World Beard and Moustache Championships, BTUSA's Eric Brown shows off his impressive set. Could Toot Joslin's reign as sideburns world champ be coming to an end? This rocks so hard! I really want to see him as winner this year!! Awesome! Just a question, why is there only a freestyle category for sideburns, and no natural sections? I like the look of the natural version in this picture, while Toot goes with the addition of styling aids. Do you think they will add a natural section? Just want to say GO BEARD TEAM USA!!! Bring home some hardware to the New Country- you have a bunch of people over here pulling for you!!! Thanks for the badge, a delight to meet you. holy cow!!! what a impressive beard, I mean that look like that ancient style, used in Ireland, you knmow is the same that you see in several movies.